Rent a Cadillac in Miami for your next trip to Miami. The elegant and classy luxury SUV is the ideal luxury car rental if your traveling with multiple guests. We have multiple options including Cadillac Escalade rental and Cadillac Chauffeur Services. Cadillac is an iconic American luxury brand that continues to provide beautiful luxury SUV’s. Inside you will find plenty of space and innovative tech with the highest degree of craftsmanship. We offer free delivery services to Miami Airport, Miami Beach, South Beach. Downtown, Doral, Brickell, Midtown, or any part of South Florida. 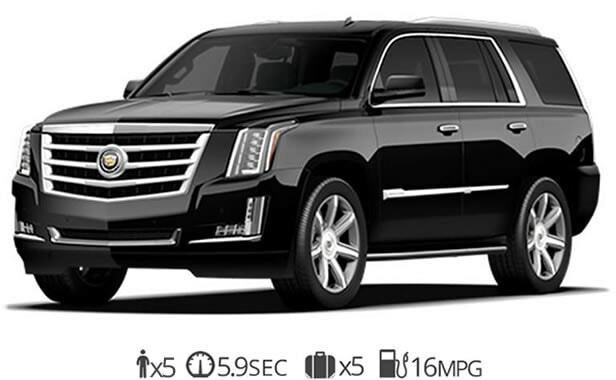 Our Cadillac Escalade rental service fuses sophistication and style in a luxury SUV. The Cadillac Escalade ESV is the extended version with plenty of additional room. It has enough space for 7 passengers to fit comfortably with plenty of room for your luggage. Equipped with a 6.2L V8 with 420 horsepower. The Escalade provides a smooth ride thanks to the magnetic ride control system The sound system inside the ESV is breathtaking. If you prefer to be driven around we offer Cadillac Escalade Chauffer services. Hire a premium luxury SUV for your next event. We offer our Cadillac Chauffer services for Weddings, Proms, Corporate Events and any special occasion. Inside you’ll find luxurious touches throughout the vehicle. There is minimal road noise allowing you to sit back and relax on the way to your next destination. There is also ample head and leg room for you and your guest. The third row also folds completely flat to provide extra storage for your luggage if required. Ready to rent a Cadillac in Miami?